Los Angeles is the turnaround port for many Mexican and Hawaiian cruises. Carnival Corp has a pier in Long Beach beside the Queen Mary with the old Spruce Goose hangar converted to a cruise terminal. The cruise terminal is 18 miles south of LAX. To use public transit from the airport, take the free "G" shuttle to Aviation/LAX Station. There is one kiosk on the west side of the station where the shuttle stops but two more kiosks on the east side. Take the green line east heading to Norwalk. Get off at Harbor Freeway Station and transfer to the 950X bus heading to San Pedro. Tell the bus driver you want to get off at the cruise terminal though you should see your ship when you get close. Shared van services operating from LAX include Primetimeshuttle and Supershuttle. When dining in restaurants, it is customary to leave 15-20% tip for good service since servers typically make minimum wage. Taxi drivers should be tipped the same rate. Banks and ATM's can be easily found in the city centers of both San Pedro and Long Beach. If you want to go by metro or if you want to go to Long Beach, you will have to head there first. Walk south from the cruise terminal with the water on your left to 7th St and Harbor Blvd by the Maritime Museum. If the trolley is running, you can pay $1 and save a bit of a walk. From historic downtown San Pedro, take the CE142 bus to Long Beach Transit Mall (20 mins, $1.50 Jan 2016). From the mall, you can take the blue line metro into LA (60 min). In Long Beach, the city's Passport bus service is free in the city center. Route C will take you to the aquarium and out to the Queen Mary. 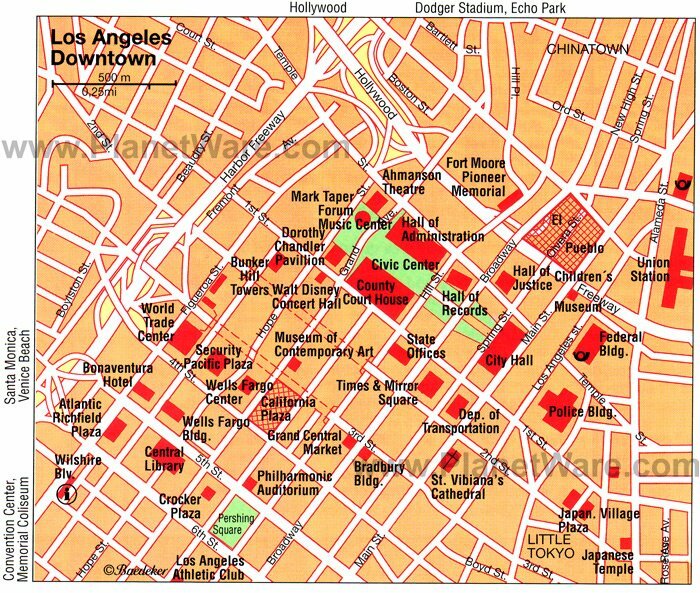 Hollywood - Hollywood Blvd has the Walk of Fame, Mann's Chinese Theater and is a central tourist spot. There is a good view of the Hollywood sign from the upper floors of Hollywood and Highland Center. Metro Hollywood/Highland. Universal Studios - If you don't want to go inside the theme park, there are restaurants and shopping outside in Universal City. Universal Studios entry is $90-115 depending on day and season (May 2016). Metro Universal City (cross the street to take the free shuttle). Beverly Hills - This area is the home of the rich and famous with luxury stores on Rodeo Drive. Not accessible by metro. Olvera Street - The historic center of LA by downtown has a Mexican market and restaurants. Metro Union Station or Dash Bus. Disney Music Center - This Frank Gehrey building can be found downtown. Free tours available. Metro Civic Center. Getty Museum- LA's most famoust art museum. There are two museums, Getty Center (the main one) and Getty Villa. Aquarium of the Pacific - One of the areas most popular attractions. Entry $29.95 (May 2016). Queen Mary - This ocean liner has been converted into a hotel. Tours availabe for $34 (May 2016). In Long Beach, City Place shopping center is north of the transit mall and has a Walmart, Nordstrom Rack and Ross Dress For Less. There are a lot of restaurants along Pine Ave. There is a Famous Dave's BBQ restaurant by the waterfront. Roscoe's Chicken and Waffles - Various locations including Hollywood. Cielito Lindo - Considered to have the best taquitos. Located at the north end of Olvera street. In San Pedro, there is a Von's Supermarket at 1221 S Gaffey St (at 13th Ave) and a Ralph's Supermarket further north at 1050 N Western Ave (with a In-n-Out Burger in the same complex). There is an Ocean Liquor Market at 233 N Harbor Blvd across the street from the cruise terminal. In San Pedro, there is a post office at 839 South Beacon St (at 8th St). In Downtown Long Beach, the post office is at 300 Long Beach Blvd. Cafes and some restaurants may provide free wifi to customers. The cruise terminal may have free wifi.